TGKP and the South East Local Enterprise Partnership both participated in a Thames Estuary Development Conference on 3 April, which included reflections on the Government's response to the Growth Commission's report - see the accompanying News Release. On 25th March 2019 the Government published its response to the Growth Commission's report. This took the form of a Written Statement to Parliament, a letter to members of the Thames Gateway Strategic Group and a policy paper published by the Ministry of Housing, Communities and Local Government. TGKP and partners' responses will appear following the local elections in May 2019. The Leader of Kent County Council, Cllr Paul Carter, wrote to the Secretary of State for Housing, Communities and Local Government on behalf of the Thames Gateway Strategic Group signalling local partners' intent to work with Government on new arrangements for a Thames Estuary Growth and Prosperity Board. Click here to see Cllr Carter's letter. The Thames Estuary Growth Commission published its report on 25th June. The "Vision 2050" summary and supporting documents can be found here. The Government has set both itself and organisations in the Thames Estuary area 6 months in which to respond to the Commission's report and recommendations - see MHCLG Press Notice. 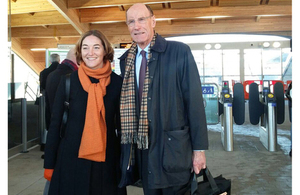 On 15 March Sir John Armitt visited Medway, hosted by Medway Council, to see some of the progress that had been made on regeneration schemes and to discuss ambitions for the future. Sir John Armitt met with the TGKP Board to hear more about our ambitions for North Kent and how the Commission might assist. In advance of the meeting, TGKP's Chairman, Rob Bennett, wrote to Sir John setting out key issues where the Commission's support might be most impactful - see Statements and consultation responses. Sectors – creating internationally-competitive centres of excellence that build on the corridor’s sector strengths, for example in ports and logistics, and making the most of growth sectors such as the creative industries. Connectivity – making the most of planned investments such as the Lower Thames Crossing, and assessing the case for other investments that have been proposed, such as further river crossings and extending the Elizabeth Line to Ebbsfleet. Communities – ensuring that people right across the corridor benefit from expected growth, including equipping them with the right skills, making sure high-quality housing is available, promoting use of the river, and enhancing the Thames Estuary’s natural environment. Delivery – working closely with organisations and communities to develop a plan for delivering the vision, aligning with the Government’s intention to explore ambitious housing deals in the area. In March 2017 Lord Heseltine stepped down from the Commission, and in the Autumn Budget 2017 the Chancellor of the Exchequer announced that Sir John Armitt would be the new Chair, supported by Professor Sadie Morgan as Deputy Chair. TGKP's Chairman, Rob Bennett, wrote to Sir John, welcoming him to his new role and reiterating TGKP's desire to engage actively with the Commission as it continues its work and produces its Report to Government in Spring 2018. In July 2016 the Commissione issued a "Call for Ideas". You can see the invitation here and also read TGKP's Response. New Thames Estuary 2050 Growth Commission announced. In his 2016 Budget speech, the then Chancellor of Exchequer announced that he was asking Lord Heseltine to lead a new Thames Estuary 2050 Growth Commission. The government has asked Lord Heseltine to lead the Thames Estuary 2050 Growth Commission. The Commission will develop an ambitious vision and delivery plan for North Kent, South Essex and East London up to 2050. This will focus on supporting the development of high productivity clusters in specific locations. It will examine how the area can develop, attract and retain skilled workers. It will also look at how to make the most of opportunities from planned infrastructure such as the Lower Thames Crossing. It will report back at Autumn Statement 2017 with a clear and affordable delivery plan for achieving this vision. "As Chairman of the Thames Gateway Kent Partnership, I welcome the announcement of the Thames Estuary 2050 Growth Commission, led by Lord Heseltine. The Budget announcement is a recognition by Government of the vital importance of the Thames Gateway to the UK’s long-term growth. In the North Kent part of the Gateway alone we estimate there is scope to deliver an additional 58,000 homes and 59,000 jobs. But for those new homes and jobs to be provided we need to find ways of securing new investment, especially in transport infrastructure. We will be very keen to work with Lord Heseltine and the new Commission, together with our partners in South Essex and London, to make this next phase of our long-term ambitions for the Thames Gateway a reality." Thames Gateway Kent Partnership is not responsible for the content of external sites.